Imagine being able to protect your children from germs and at the same time protecting your car seat, buggy seat, carpets and floors, and those of family and friends, from nappy, toilet and potty training accidents. This is what the revolutionary new Pee Pads from Dusky Moon® can do. The Pee Pads are the first disposable protective pads on the market for children. Using revolutionary colour changing technology they integrate hygiene, practicality and education with nappy leaks, toilet and potty training. Designed by two mums who are passionate about safety, hygiene and travel and, who have between them seen four children go through the stressful time of potty training, this unique range of Pee Pads are a welcome innovation to the parenting world. Gone are the traditional material car seat and buggy liners, in their place is an affordable, disposable, lightweight, absorbent and simple to use pad that changes colour when it comes into contact with pee helping parents know their children and the pad needs to be changed. The leak resistant back liner will protect the seat fabric and the product has non-adhesive strips that keep the pad securely in place. Being disposable the seat liners are hygienic and prevent the spread of germs and long lasting smells – simply remove the old liner and place it into the bin and replace it with a new one. The pads are small enough to fit into a handbag for parents on the move. Until now there has never been a disposable product on the market that protects the floor and carpet around the toilet from the inevitable drips, drops smells and germs that come with toilet training. With this Pee Pad and its’ amazing colour changing technology parents can actually see where accidents have happened when their children are using the loo, helping to teach them to aim straight! By being colour changing and disposable the pad helps to keep the bathroom a hygienic place as parents can see when the pads need to be changed. The Pee Pad for a toilet is super absorbent and has a leak resistant backing with adhesive strips to keep the pad securely in place. The pads are small and lightweight making them perfect for travelling to family and friends and to protect their carpets and floors at this eventful time! The world’s first Pee Pad for a potty is now available from Dusky Moon®. This circular Pee Pad is placed on the floor with the potty being put on top of the pad and with its leak resistant backing it protects carpets and floors both at home and when away. The unique colour changing technology allows children to see and learn from their spills and for parents to see when accidents have happened and to dispose of the pad, keeping everything clean and germ free. The Pee Pad helps to make the potty training area instantly recognisable and provides an identifiable and familiar place for children to be when they need to use their potty. Perfect for travel , this product is also designed to protect children from germs when out and about. When training there are the inevitable moments when a potty is needed, perhaps at a garage or on the side of the road, by using the Pee Pad for a potty children are protected from the dirt and germs that can lurk underneath the potty. On Thursday 14 October, Amanda and Venetia were interviewed on ITV’s Daybreak. You can read more and watch the programme segment here. Family Soup is a new wiltshire online magazine written for families by the talented Kate Peach. http://www.familysoup.co.uk The chain is a series of interviews with a selection of the region’s most interesting people. From entrepreneurs to avid collectors and community heroes, each interviewee has led us to the next, building a chain of people living in Wiltshire. 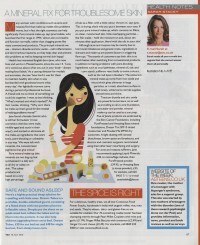 Last month’s interviewee, Emma Ford, put soup in touch with Amanda Allerton, the Neston mumtrepreneur who manages to juggle business and family to great effect. 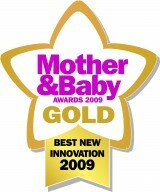 Dream Tubes® has been given the Gold Award for Innovation at the prestigious Mother and Baby awards 2009. 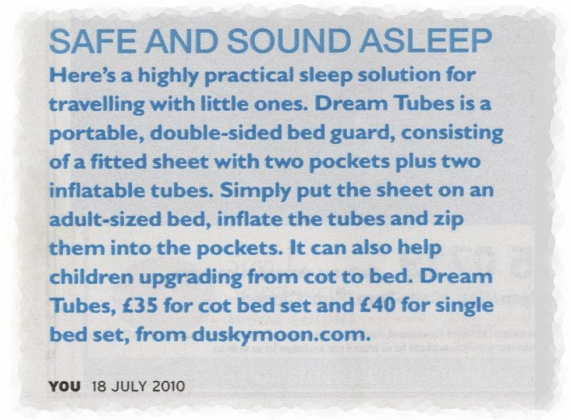 This award means so much to Amanda and Venetia, especially as the testing was done by mothers – a great endorsement for the Dream Tubes®.